Did you forget that dot after the Ibid? We often forget dots (.) after common words, like Ibid. 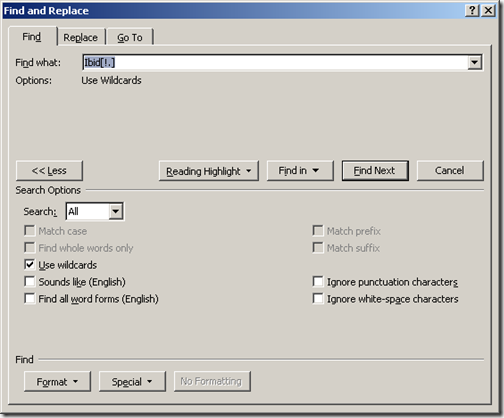 How can we search a word document easily to see where we have missed that trailing dot? 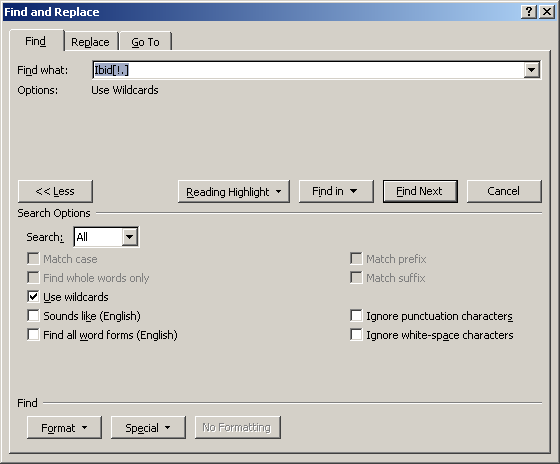 Best way is use the Wildcard feature of Microsoft Word. You basically search for “Ibid[!. ]” (everything between the quotes) It means, Ibid followed by anything but a dot. This would catch Ibid followed by a space, but would also catch Ibid followed by a carriage return. 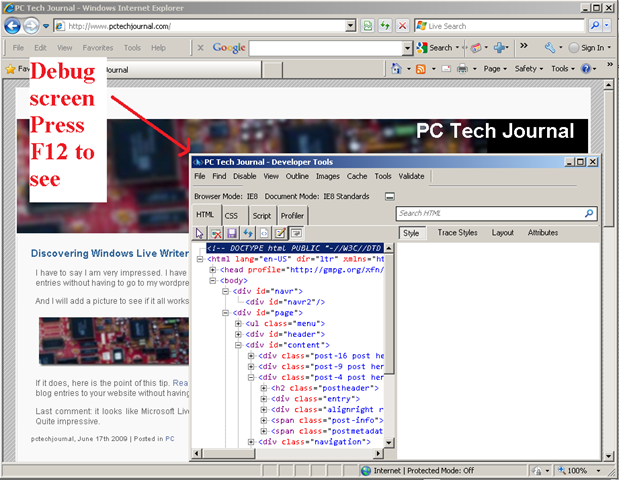 Internet Explorer 8 locking you down? Sometimes, a website creates Internet Explorer windows where they disable all menus, all right-click menus, etc. And sometimes you really want to understand what the html source for a particular page is. Quick tip: To access the debug screen, just press F12. At least you will be able to see the source of the site and maybe understand what is it that the website is trying to hide from you. This could be interesting when you are trying to retrieve the real link for an object on the page, for example the URL of a picture. I have to say I am very impressed. I have just configured Windows Live Writer to allow me to post entries without having to go to my wordpress installation. And I will add a picture to see if it all works. If it does, here is the point of this tip. Read this article on what desktop clients you can use to add blog entries to your website without having go to through your browser. Last comment: it looks like Microsoft Live Writer does not “pollute” the html text with extra tags. Quite impressive. What a great idea for a blog! I have a question for you. I recently bought a mac. I have heard that they generally don’t get viruses. Does this mean that my computer will be safe without installing any virus protection software? If I wanted to be extra safe, would a product like Norton Antivirus or McAfee work on a mac? Well first, congratulations on your recent purchase. You must be really happy! What you are saying is true, particularly if you use the PC as the measure against which to compare. That being said, you might still want an antivirus. You also should consider other possible attacks, particularly when it comes to protecting sensitive data. No matter which operating system you use, there will always be people out there trying to make a fast buck by exploiting known bugs, system vulnerabilities, or lax users. I advise spending your money not on Mac antivirus software but on a good phishing-protection application; at the very least, consider using a browser that offers built-in phishing protection. Your Mac’s file system is probably safe from malicious hackers, but your identity may not be. This blog will be dedicated to giving out good personal computing tips! If you have a question, feel free to comment below or to email this blog at pctechjournal …… at…….. …. aol.com. My computer ate my class notes! The best thing since slice bread? CoinEarn - Free Bitcoin Faucet, Win Free Bitcoins every 15 minutes! on Did you forget that dot after the Ibid?